« For Future Doctors: MMC waking up……….? In March 2012, I wrote an article of the same topic. It was about a referral letter from a pharmacist who was managing the patient’s Diabetes and his diabetic foot. Patient ended up with a BKA. The Ministry always says that despite all the unofficial complains about pharmacist acting like doctors, there are no official complaints. Thus, I decided to send the letter and an official complain to Jabatan Kesihatan Negeri and MOH. Both the UKAPS and Bahagian Penguatkuasaan Pharmacy came to see me and I provided all the info, even the patient’s particulars. Unfortunately, during the interview by the person from Bahagian Pharmacy, I was told that diabetic medications are Class C drugs and thus, can be prescribed by a pharmacist without a prescription ! Of course I know that but should they be managing the patient like a doctor? She claim that they should not and should advise the patient to go and see a doctor. After that, I did not get any feedback from both Jabatan Kesihatan and MOH. Last week, I received another interesting referral letter, as attached. Surprisingly, it is from the same pharmacist!! It looks like the pharmacy is still alive and kicking and doing the same stuff again. A patient with Diabetic foot was taking multiple types of medications from this pharmacy for the last 1 month (after an initial treatment at another private hospital), including antibiotics! She was given Metformin, Gliclazide MR, Glipizide, Galvus and Unasyn ! I never knew you can give 2 different types of sulphanylurea for the same patient. 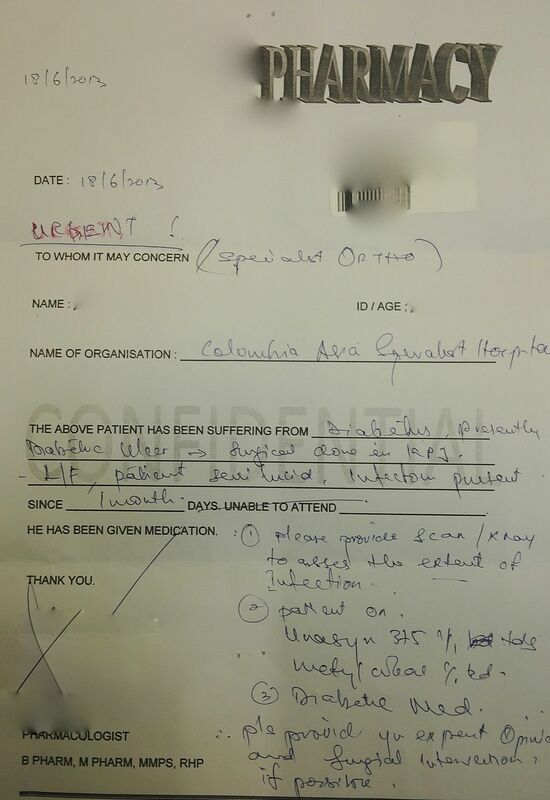 Worst still, the treating pharmacist do not even know the renal status of this patient! Another shocking thing about this letter is the instructions given. She is practically ordering the “specialist” on what suppose to be done for this patient. As a Consultant myself, I do not write letters like this, even if I were to refer the patient to a MO in KK etc. However, this “so-called” pharmacologist has written what we should do, like providing X-rays and Scans to look at the extent of infection, to provide surgical intervention etc. Very interesting and daring indeed. A BKA had to be done for this patient due to late presentation with almost gangrenous Left foot. Well, in this Bolehland, anyone can do anything. I had again sent this letter to Jabatan Kesihatan and would like to see their response. In fact, I had seen several patient who had visited this pharmacy who claim that there is a doctor in the pharmacy! It looks like they are behaving like a doctor and our ill-informed patients believe that they are doctors. One patient even told me that it is doctors who are running this pharmacy!! WTH! I am impressed with the ‘pharmacologist’ title, this is the first time I am seeing a title like that. Isn’t pharmacists under the MMC and MMC can investigate this too? Or does the pharmacists have their own Council? Impersonating police officer is a serious offence and crime. I wonder if it is the same if one impersonates doctor. In my opinion, this is more on mismanagement of the chronic disease with complication. A pharmacist or General Practitioner, professionally has to be fit enough to identify patient under what medical circumstances need to be referred to specialist like the case above to a specialist who specialised in Diabetic Management. Every profession do have its “black sheep”; and in my view, this is not about what health title you have; or what right to prescribe Group B or Group C of medicine; but is more on the person conscience and responsibility to handle cases professionally. If the health profession is not trained on certain area of medical field like diagnosis; kindly don’t ACT like one. From the way he write the referral letter, it seems like he clearly receive some clinical training thus he dare to recommended some investigation as he suspect there might be OM. I can’t comment whether it’s the “pharmacologist” fault as we don’t know what’s the exact time frame and the serial of event. This guy could have presented quite late to the “pharmacologist” in the first place, he took some good history and he/she might be doing a favour by picking up the important information and send the patient back to hospital for further investigation. Else it wont be that the patient lost his leg, but his life as well. i agreed that the medication is really messy, but we can’t be sure that’s prescribed by the pharmacologist or it’s some old meds prescribed by some GPs outside. When a patient jump from a GP to another, they get different kinda of funny prescriptions and there u go, 2 sulphonylureas, a gliptin and a biguanide… Pharmacist has the responsible to check the medication that doctor prescribed, but it’s not their responsible to check patient’s renal function. As you mentioned, they are not doctors, in the most ideal situation, they should know the patient’s renal function, but you wouldn’t expect every patient who walk into the pharmacy holding a blood test result showing their latest renal function to the pharmacist. If the patients can’t replenish their medication on time, they will end up with DKA/HHS in Emergency….so, it’s kinda difficult situation for them.. Most pharmacists wont discontinue pt’s old medication as long as they stable on it (even it’s wrong to have 2 sulphonylureas), in this case, it’s important for the pharmacist to send the patient to a doctor to review if he/she suspect some medication error. I’m just looking at the case from a more neutral position. At the end, it’s down to patient’s education and compliance, communication between doctors and pharmacists regarding their prescriptions/indication and regular follow up. Nope, I asked the patient many times of what happened. I did not tell the whole story above. The patient initially underwent a debridement at another private hospital but defaulted. Subsequently, went to this pharmacy few times over the last 1 month (from 15/05/2013, to be exact). ALL the medications were given by this pharmacy as the private hospital did not give any diabetic medications upon discharge except antibiotics. It was a GP who was managing her DM till the referral to the 1st private hospital. She did not go back to the GP either after discharge from the 1st hospital. If you are not sure of the patients renal function then you should not prescribe any medications and should immediately refer to the nearest hospital. As you know giving these medications in a renally impaired patient can cause more harm than good. In a way, the patient is to be blamed for defaulting her GP follow up and attending a pharmacy instead. Could be due to costs issue or just plain ignorance! Another issue which I have realized that this pharmacy clearly has a template for writing referral letters. And also, note the part ‘unable to attend’. This referral letter can probably double up as a Medical Certificate too if needed! Lets make it simple, Can u ask a taxi driver to fly a plane ( he is not a train pilot but he can fly a stimulator flight )? Plain simple, you just do not do stuff you are not trained for because you do not have the right to do so an is illegal. as a 4th year phar student tis is my opinion..i suspect tis pharmacist did his bpharm wich encompasses all disciplines of phar including clinicals n furthered his mpharm in pharmacology(i suspect he is frm usm png)..
bein a registered phar(rph) n member of malaysian phar society(mmps) mde tis phar 2 prac out of boundary in our msian heath cre system..
wher d doc diagnose and d phar prescribe..unlike d usual scenario d doc diagnoses and prescribes..
its a good indication of realisation and implementation of our SPECIFIC and SELECTIVE roles in d health cre sys..
but taking into count d pharmacological regiment n even no fbc/renal test ws done or suggested to b done shows tat pt therapeutic planning is not tat proper.. Sorry. The usual scenario is indeed “doc diagnoses and prescribes..”. Only the doctors are authorised to diagnose and write a prescription form and ask their patients to BUY their medicine from a nearby pharmacy, not “d doc diagnose and d phar prescribe”. Pharmacists are to check the medication and inform the doctors if they do not agree to the drug or dosage given. Even if you change the dosage without informing the doctors it could land yourself in plenty of trouble. Some of you replying here are either pharmacists or pharmacy students. The main issue which you guys are missing out here is that it is not an issue of “therapeutic planning that is not proper”, how “clearly receive some clinical training thus he dare to recommended some investigation as he suspect there might be OM” nor how “Most pharmacists wont discontinue pt’s old medication as long as they stable on it (even it’s wrong to have 2 sulphonylureas”. This is a case of someone acting beyond her capacity as a medical professional. in other words, trying to be smart when she isn’t (based on the fact that two SU were prescribed). You can ask Dr. Pagalavan if he would treat this patient if he does have OM. I am sure like me, he wouldn’t and would rather refer the case to an Orthopedic surgeon. There is no therapeutic issue as even basic management in the first place is wrong ie. there was no indication of this person even bothering to find out the patient’s basic blood profiles, and nowadays, in regards to the quality of clinical training provided by some schools, even many doctors lack clinical training and recognition, what more a pharmacologist. Clinical training means you see a real/mock patient, take a history, examine the patient, all under the supervision of a clinician, not the pakcik across the road. And I do have pharmacists (the good ones) who do alert me of drug interactions and who do give me recommendations on alternatives, so it is unfair to say that a pharmacist will not discontinue a patient’s old medication as long as they are stable on it, even if the meds are wrong. Kinda stupid right? I have personally been into pharmacies where the attending pharmacist is busy telling patients with chronic illnesses what to do, what to take, all without any proper history taking, nor any blood results. Sigh, we already have many crap doctors, now do we need to have to deal with another group of posers? Some patient just want cheap medical healthcare but not even willing to spend time in gov hospital, so they will end up with these pharmacists. Do not expect to be spoon fed. There are lots of information in Dr. Paga’s website which you can find out yourself. *Likes* this comment a la’ facebook. Helo dr! Well, I am going to do medicine degree next year! And I m so excited and passionate about this! I would like to ask for Ur suggestion on which uni and medicine pathway that I can go for~I have no idea in choosing which uni should I go for in Malaysia, hope to hear from u! Thank u! The obvious lack of systems organization is clearly destroying whatever good relations pharmacists and doctors have in this country. So the question is, why are pharmacists prescribing? Why are GPs doing cosmetic surgery? Why are private surgeons more operative than their government colleagues? Why are microbiologists hiring doctors in their labs? Maybe the real answer is this :- Everyone wants to make ‘more’ money but they cover their intention with the excuse that they are giving value added service to the patient. The real problem is this… where are the regulators? The regulators claim they have no framework to enforce regulations. So this goes towards policy and politics. Ah yes, politics. Lets not open that can of worms. I think the real potential for solving these problems are the impending re-organization of the national healthcare system (national healthcare financing scheme, 1care, etc). How would this reform our system? Would the regulators have more authority and resources to chase after ‘those that defile the ethical sanctity of their professions’? I couldn’t agree with you more Chillax. Rogue GPs are as abundant as rogue pharmacists in bolehland. While most can agree that the healthcare system is in need of reorganisation, I suspect that it won’t necessarily be done in the rakyats’ best interests. Rather, the interests of ‘connected’ businessmen, GLCs with stakes in private healthcare, and politicians looking to make a quick buck by acting as middlemen in various schemes will be out to make sure their interests are given priority. Aaaaand, nobody mentions a cornerstone of diabetes management: Podiatry. LMOs (GPs) are the ones who usually look after diabetes. 1. Your average Malaysian wants to see a specialist for everything. Very few actually have an enduring relationship with their GP. Some will even go to multiple GPs and not tell a consistent story (cos they are shy about admitting to having seen other GPs). 2. There are those MOs who have gotten by being a lousy or lazy HO/MO and go on to open a clinic once they finish their 4 years. There are also those who are very capable and have gone on to do a diploma or Masters in Family Medicine. We can’t expect the general public to know the difference – to them, they are both GPs. Personally, I think anyone who wants to be a GP should have the Family Med diploma as a minimum. Yes, GPs suppose to manage diabetes but sometimes I feel that our KKs are managing DM better than GPs. You must understand that any doctors can open up GP practise in malaysia. I know of a patient who was referred to an endocrinologist for ” poorly controlled diabetes”. Patient was poorly managed for years under one GP with metformin and sulphonlyureas for years and HbA1c was rarely checked, let alone blood glucose levels. By the time patient presented to the endocrinologist, patient had diabetic retinopathy and also peripheral neuropathy. Had to be started on s/c insulin by then. Although GPs are ideally supposed to manage diabetes, but honestly I would be doubtful with the level of knowledge of GPs regarding current IDEAL management of diabetes. There are many old school GPs who are still sticking to just metformin and sulphonylureas, even prescribing long acting glibenclamides to elderly patients. Managing diabetes is very much multidisciplinary, involving podiatrists, opthalmologists,nutritionists, diabetic nurses and what not. By the way, I am not against GPs managing DIABETES, but I agree with Nav, that a GP nowadays should have a diploma in Family Med and at least linked with a multidisciplinary team too. But of course, in Bolehland, this may take another 10 years or more. Your thought on this: Singapore is taking in just qualified Malaysian HO ( just finish their 2 years training ) in their private practice. Firstly their degree must be recognised. Secondly, in private practise, I presume private hospitals, MO’s job is in A&E department. They don’t do any ward or clinic work. If SMC allows, than should not be a problem. But usually, SMC keeps a close watch on this type of doctors. Generally they get temporary registration. GP is a dying field in singapore. Sorry to say that doctor, GP is still doing ok in Singapore but not great. A lot of my daughter’s classmates parents are GP, I have two family doctors, besides seeing normal patients, they are doing the medical check up for maids, foreign workers and students. I pay about SGD22-26 every half a year for my maid. As 2011 data, Singapore has 1.2 million work permit holders. When I visit my family doctor, I always glance at the previous day waiting name list, averagely about 100-120 patients per day. The normal fever and flu is about SGD18-24. The working hours is long , 8am-12pm, 2pm-4:30pm, 7pm-9pm, Saturday no night shift, Sunday till 12pm. I know one very bad GP, no locals, do only check ups, his clinic is always empty but manage to survive for the last 18 years. By the way, my two family doctors are 80s’ UM graduate, humble and kind. I heard of some young GPs are arrogant. I remember reading in your blog somewhere that with only HO experience the doctor is not able to be a competent GP. So my question is actually more on why singapore is allowing this? In singapore, not many wants to become a GP. Even their government polyclinics are dependent on foreign doctors. Majority of their doctors work in hospitals. THus, they may have allowed some clinics to hire these doctors. As I said, they do have a good monitoring system unlike Malaysia. Why is Singapore doing this? Because that’s the way they have always done it. Nonetheless, things are changing now. You are quite disadvantaged in terms of your practice if you don’t sit an exam for the family medicine diploma Singapore, so most new GPs tend to do it. That’s one way (but not the only way) of ensuring only competent practitioners are plying their trade as GOs. Any action taken by MOH ??? ?